Cash Value Multiplier used to normalize contract amounts over different securities. Default value is 50, so 15 100 dollar contracts count as 30 towards working order and total contract limits. Maximum allowed total long or short option premium, in dollars. These parameters applicable to the BTS live SPAN margining system. This parameter is used to increase or decrease leverage on the initial balance of the account. 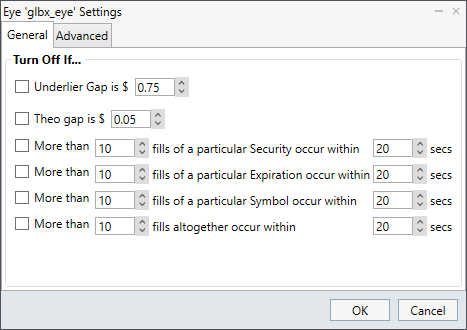 This parameter is used to increase or decrease the dollar amount of available margin for an account. If set this setting will cause the quoter to join the market rather than improve upon it. In other words, the quoter will never lead the market. Optionally the quoter can require a minimum size (min gate size). If this minimum size is not met the quoter will not produce quotes for the specific security. 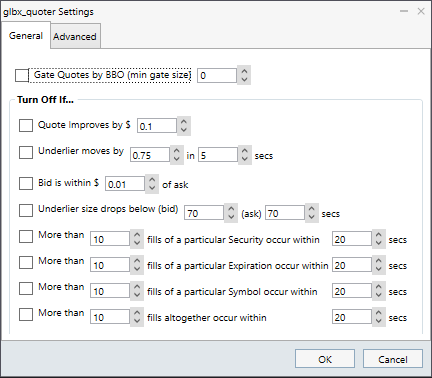 If this safety is set the quoter will shutdown if it detects a parameter change that improves on quote values by the specified amount. The aim of this safety is to prevent erroneous parameter changes (i.e. "fat finger" changes) from resulting in bad quotes. If this safety is set the quoter will monitor underlier price gaps and shutdown if they occur. If this safety is set the quoter will monitor the quote bid/ask spread and shutdown if it's smaller than the specified value. If this safety is set the quoter will monitor the size available for the underlier and shutdown if it drops below the specified value. If any of these are set the quoter will shutdown if the specified fill condition occurs.